Posted on October 27, 2017 , in Hot Tubs. Hot tubs offer a wide range of health benefits and are a fantastic way to relax and unwind. On today’s market, there are many hot tub accessories that can be purchased to make your experience even more enjoyable and versatile. Below, we will discuss some of the top hot tub accessories that can be used to elevate your hot tub soak. Well-known for its therapeutic properties and wellness benefits, aromatherapy is an easy option to include in your hot tub routine that will take your enjoyment even further. However, before using any aromatherapy product it is critical to make sure that they are designed and safe for hot tub usage. Essential oils that are not specifically designed for hot tubs can cause damage to internal components and the acrylic shell. If unsure, always ask your local hot tub dealer to confirm. Sound Systems – There is a wide selection of sound systems to choose from that are not only waterproof but specifically designed to be used in hot tubs. With these, the volume and music selection can be controlled while you are in the hot tub. LED Lights – From sparkling, colorful lights for an evening of entertainment to soft and relaxing glows to unwind, LED lights help to create the perfect experience for every occasion. There are multiple options and price ranges available to find what will suit your style and needs. 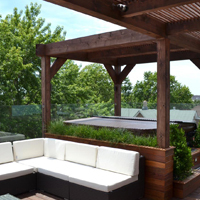 Furniture – A nearby comfortable lounge area will integrate your hot tub into your landscape and make for a more relaxing and social experience. Today, there are so many types and styles of patio furniture, towel racks, BBQ grills and even robes and slippers to accessorize your hot tub area to make the most out of enjoying your space. Make your hot tub experience even better and more social with a game night. From waterproof card decks and checkerboards to floating games meant for gatherings, these accessories will give you hours of enjoyment. Although not as exciting as some of the other hot tub accessories, you will appreciate tools that will help keep your hot tub in top shape and ready to enjoy at any time. Make cleaning so much easier by investing in a floor vacuum, skim net and brushes so that you can spend less time cleaning and more time enjoying your hot tub. Now that you have an idea of what accessories can be used with your hot tub, you can start learning more about the many models and features available. To get started, click here to download a hot tub buyer’s guide.